What now feels like three lifetimes ago I spent my evenings, weekends and summers providing support to children and adults with a wide assortment of special needs. And though I was not Between Disney at the time, I was blessed with a love of movies. However, these jobs wore me out on some titles as youngsters rewatched and rewound the same film and scene over and over again in living rooms and community centers. To this day the Between Wife refuses to watch The Sandlot, a classic! So when I saw a description of Life, Animated, I knew I had to take in this Between Book. 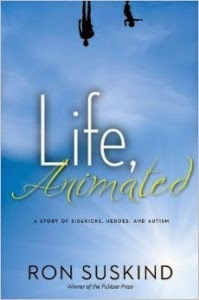 Life, Animated: A Story of Sidekicks, Heroes and Autism by Ron Suskind tells the very personal story of the author's family. Ron and Cornelia Suskind were blessed with two vibrant sons. However, their second son Owen began to developmentally regress as a very young child. His regression was painfully witnessed by his parents as his language became non-existent, he was increasingly anxious and skills he had mastered like drinking from a big boy cup were lost. Doctors would diagnose Owen with being on the autism spectrum and Owen's parents looked to an uncertain future. There appeared to be no openings into their son's private world and specialists warned them about his limited capacity to learn and progress. Owen moved into a routine of watching Disney animated movies, including rewinding scenes, with his entire family. And then one day Owen spoke, repeating a line from a Disney song. This act was followed by further instances of communication. The family then used Disney movies as a tool to help Owen expand his communication and social skills. Suskind after this breakthrough outlines the family challenges working through the educational system and helping a young man trapped in this own mind express himself and show the world his inner thoughts be it by using the voices of those he has seen on screen or drawing his favorite sidekicks. The book ends with a contribution from Owen, a story about his favorite kind of Disney characters...sidekicks. Life, Animated is an incredibly personal book. It really is the story of Ron, Cornelia, Walt and Owen Suskind. And the Suskinds open their life to show the pain of uncertainty in raising a child on the autism spectrum. They (since Ron really speaks for the whole family) share the pain of being uncertain of your child's future and the fear of making the wrong choices. The Suskinds open the doors to Owen's triumphs as he is able to find ways to express himself, along with the pain of when showcases of Owen's abilities go wrong. As a reader we are upset as Owen is "exiled" from one school and we feel his pleasure as he leads a successful family play. We get to walk with them for some of their triumphs and failures. The reader understands the outrage of parents as they witness their child being bullied and retreat from the world around him. And I hope that it gives hope to other families. Yes, the Suskind family experience are unique to Owen and their family situation. And honestly as magical as Disney movies are they will not be an affinity for all children. Results truthfully do vary by individual and they do not offer a magic formula. But by sharing their experience I hope that others can see that even in uncertainty and in the face of massive challenges every family can find their own share of victories. And despite a solitary feeling, there are others who have walked not the same but similar paths. Owen is one of us, he is a true Disney fan. Owen would like to spearhead the return of hand-drawn animation. And he would prefer that resurgence to start at Disney. Owen knows more about Disney movies, voice actors, animation processes and animation history than most of us will ever know. 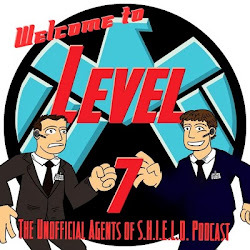 As a Disney fan our hearts soar as Owen discovers voice actor Jonathan Freeman in a stage production of Mary Poppins and connects him to one of his favorite villains Jafar. I found myself in awe as I read Owen's analysis of Disney movies, how they connected to real life and finally having Disney artists validate those insights. Readers will love reading of how Owen used his love of Disney movies to create a Disney club for others who enjoyed Disney films and needed to express themselves and socialize with others. And I found myself tearing up as Owen met Disney animators and discussed past creations and Owen's possible contributions to the future. And probably out of all those Owen meets it is probably meeting Eric Goldberg, Disney's sidekick animation specialist, that made me happy for Owen. To be fair, it is the Disney aspect that pulls Disney fans into this story. But it is a story of a family, including some Disney magic. The Suskind family discuss much much more including the specialists and schools the family worked with. The attempts to provide Owen as much of a typical experience as possible, modeled after his brother Walt. A reader with no background in children on the autism spectrum will walk away better informed about education options, therapeutic theories, and the complexity and expense of raising a child with special needs. Honestly, if it takes a Disney hook to pull you into that story it is a win. Life, Animated is the story of a family who continue to face a challenging world. And Ron Suskind introduces you to his son Owen. As a Disney fan, you would likely find it easy to cheer on Owen as he finds his place in the world. As a human, Owen reminds you that our judgements of others are shallow and typically off-base. In the end the Suskind's remind us that those who face challenges are not alone and they give us all hope for the successes on the horizon. And Owen will help us understand that there is an inner hero within each of us.